Accommodates packages or containers up to 14" wide and 6" height. Separate upper and lower heat controls provide maximum flexibility in temperature control. Each thermostat is dial type and totally solid state. Temperature range for each chamber (upper and lower) is from abient to 300 Degrees C (572 Degrees F). Infra Red bulbs providing heat source are long-lasting and easily replaceable. Conveyor is rod type with 1" spacing between rods to allow excellent heated air circulation around all surfaces of package. Conveyor speed is dial controlled from 0.6" per second to 5" per second. 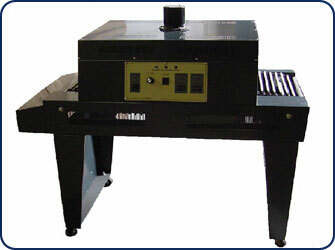 Capable of use with almost any film type - PVC, POF, PP and PE. Internal fan (extended mount) provide excellent air movement through the entire heat chamber (essential to uniform shrink). Heavy duty castors allow the machine to be easily moved by one person.